Update: Added the new movie poster for Pet Sematary (2019) which is far more scarier looking than the previous poster released. Circle April 5, 2019; on your calendar as the official release date of the new Pet Sematary movie based on the popular and scary Stephen King novel. 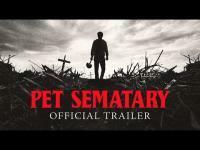 Update: Pet Sematary (2019) is now releasing in movie theaters on April 5, 2019, from its original April 19, 2019 release date. Synopsis: Louis Creed, his wife Rachel and their two children Gage and Ellie move to a rural home where they are welcomed and enlightened about the eerie "Pet Sematary" located near their home. After the tragedy of their cat being killed by a truck, they resort to burying it in the mysterious pet sematary which is definitely not as it seems as it proves to the Creeds that a pet isn"t just for life..